* Schedule is tentative… please check back for more updates and confirmations. Just a quick post as a memorial to the great shows of 2014. Looking forward to the 2015 convention season. Hope to see you all at one or more of them! March 7-9, 2014 – Booth #B46 – Thanks for an amazing show! Hope to see everyone next year! March 29, 2014 – Thanks for a fun show! Hope to see everyone next year! April 18-20, 2014 – Booth #SP-094 (Approbation Comics) – Thanks everyone! See you next year! April 25-27, 2014 (Attendance tentative) – Won’t be able to make this year. Hopefully 2015! May 18, 2014 – Thanks! May 31-June 1, 2014 – Booth #1007 – Thanks everyone! See you next year! June 14, 2014 – This show was cancelled & rescheduled for Jan 2015. June 20-22, 2014 – Booth #T164 – Thanks everyone! See you next year! 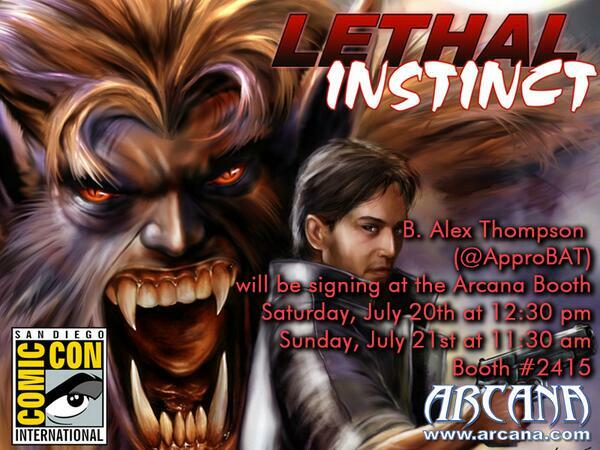 San Diego Comic-Con – Thanks everyone! See you next year! September 12-14, 2014 – Thanks everyone! See you next year! Oct. 4-5, 2014 (Attendance tentative) – Won’t be able to make this year. Hopefully 2015! October 9-12, 2014 (Attendance tentative) – Won’t be able to make this year. Hopefully 2015! I haven’t updated this blog with a new post in a while. I appreciate everyone who reads this stuff and actually look forward to my ramblings. Late 2013 and early 2014 have been keeping me VERY busy. Since writing is now my day job, I have multiple WFH (Work For Hire) projects I have to stay on top of every month. Next to that are my personal comic projects that are in various stages of being written, edited, drawn, and lettered. The biggest thing in that area is that we have started production of the Chaos Campus Act 2 issues (#21-40 plus EC #6-10). I’m a much different (hopefully better) writer than I was when I started the Chaos Campus experiment, so hopefully this section of the saga will improve the series (and make up for mistakes and missteps of the first Act). As you may or may not have noticed from my Events & Signings page, I’m doing a lot of shows this year to promote and sell my current library of titles. That has been a fun, but draining experience (be sure to read the Bleeding Cool articles for more details). The biggest thing throwing my usual schedule off is that I have started writing novel manuscripts. Writing prose takes a much different set of writing muscles than writing scripts, so it takes much longer and more out of me. I am determined to get at least 4 books written and published within the next five years, so wish me luck on that front! The first will be Corporeal (which you can find out more about with this link). Following that will be The Children of Mercury Heights series of books. More about those later. Well, that will do it for this blog update. Please keep coming by to see me at the shows… I love talking to you guys in person! Just a quick post as a memorial to the great shows of 2013. Looking forward to the 2014 convention season. Hope to see you all at one or more of them! March 29-31 – Thanks for a great show! See you next year! July 18-21 – Thanks for a great show! See you next year! September 7-8, 2013 – Wasn’t able to make it this year, but see you next year! September 28-29, 2013 – Thanks for a fun show! October 11, 2013 – 6pm-10pm – Thanks for a great show! See you next year! Nov 1-3, 2013 – Wasn’t able to make it this year, but see you next year! Nov 23-24, 2013 – Thanks for a great show! See you next year! 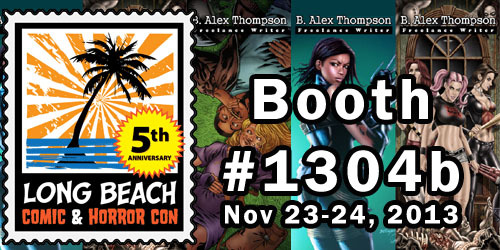 For everyone attending the Long Beach Comic-Con next week, stop by to see me at Booth #1304b! I’ll be promoting a special limited edition LBCC only printing of Hass #1 (only 100 copies printed, so get yours before they’re all gone). There will also be copies of Chaos Campus along with a few random surprises. As mentioned on Twitter, I’m attempting to write a novel as a creative palette cleanser. It’s a crazy little experience. Also as mentioned in that Twitter entry, I can only seem to work on this novel for two hours… from 1am to 3am. I work on scripting from like 10am to around 6pm (that can go up to 8 or 9pm on a really good day). Off and on I’ve been doing research on the craft of prose writing and other things related to creating a novel (since I’ve been a script writer for the best part of the last decade). One thing that stops most potential writers in their tracks is the first line. I understand the fear… it’s the first words a reader sees of your work. That line could be the difference between someone continuing into the story or putting the book down never to return. That’s a lot of pressure… pressure that I avoided. How? By realizing that this is a first draft. Not even a first draft… a “trash draft.” I’m just getting as much of the story as I can down in whatever form it comes out in. My first sentence is a reminder to myself to research more about car accidents. Why not? I don’t plan for anyone else to see this draft anyway. Maybe Denise and John, but they understand, lol. Originally this story was going to be a comic book mini series… but everything I wanted to put into it wouldn’t fit into four to six issues. Then I considered making it a TV series, but then I got caught up in freelance work and couldn’t devote any time to it. After a few months passed I realized I wanted to begin the story at the beginning of the incident and not years later as I planned. Then I made the antagonist the protagonist’s brother. So though I had plans and ideas on where the series would go, because of the character and story changes a lot of the motivations and plot will go in different directions. On one hand I like the challenge and adventure of seeing the new places the story will take me. On the other hand it’s a bit confusing having two unfinished versions of the same story swirling around in my head. Alright, there were other points I wanted to bring up, but I can’t think of them at the moment so I’ll guess I’ll wrap up this blog entry. Thanks for stopping by and taking part in my insanity. I need to do more blog entries so maybe I’ll do a follow up soon. We’ll see. Until then, back to work I go! 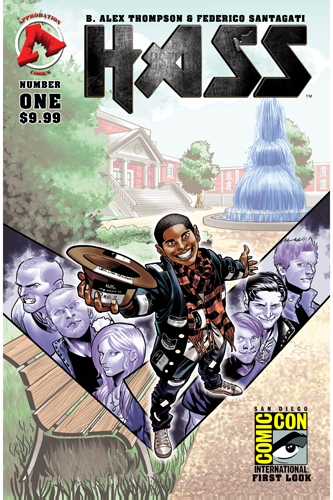 There were 50 limited First Look copies of Hass #1 printed for SDCC. Here’s the first review for the issue! Hass is a four issue mini series and we hope to have more news for the series within the next few months. 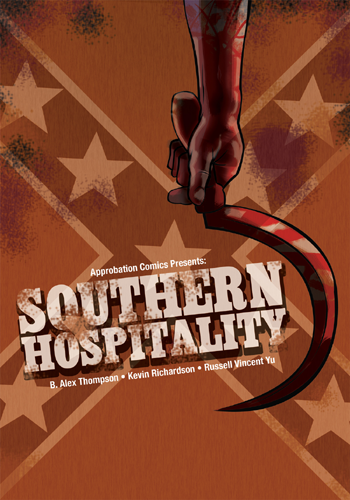 The next project I plan to push heavily around the Long Beach Comic-Con is the Southern Hospitality graphic novel. Artist Kevin Richardson made a cool blog post that gives a little background insight on the book as long as a sneak peek of the interior art! 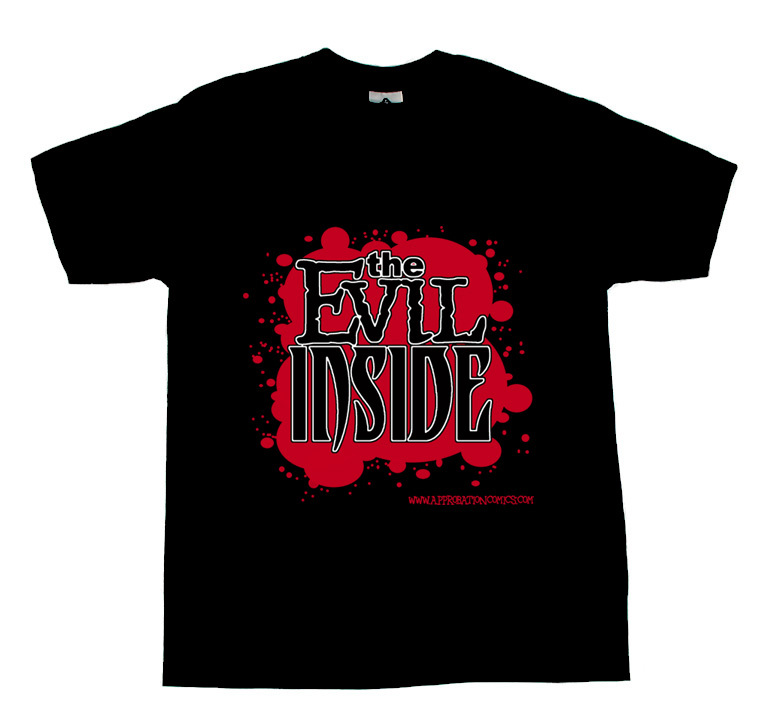 If all goes as planned I will have Evil Inside tee shirts for sale, too! I will also be stopping in at the Lion Forge/Geekscape booth (#3919) when I can to help preach the word about The Chosen and Catalyst Prime! Hello and welcome! My name is B. Alex Thompson and I’m a writer of comic books, graphic novels, screenplays, teleplays, and more. This is a new site so pardon the dust as we continue to move things in! If you’re in the market to hire a freelance writer, I am available for new projects! I have over a decade of experience in script writing and would love to bring YOUR project to life with the printed word! I’m talented, dedicated, motivated, disciplined, punctual, and able to work with almost any budget. If you want the exact storytelling experience you’ve been looking for, contact me today!